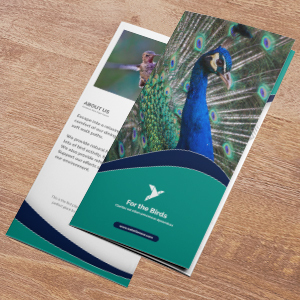 Brochures are a way to interact with customers and generate leads: they can be left with clients after a sales call, you can hand a walk-in customer a pamphlet about your company or use a direct mail campaign to advertise the services that your business offers. Brochures can be used to promote, advertise, inform or guide. Include a business card or business reply card and watch your business grow. Whatever the purpose of your marketing piece, our printing services are here to help you maximize the impact you have with your audience. Printed brochures often have pictures or blocks of color that go to the very edge of the page. To ensure your pieces looks great, your file must be set up using a bleed. Extend the image or color 1/8th of an inch past the document edge. Not sure how to make a brochure? Ask about our brochure design services! Our paper choices range from economic to premium. We also have several print options available to fit your budget. Finished brochures can be picked up, delivered, or mailed directly to your clients. Review our blog post, "A Breakdown of Specialty Fold Types for Your Next Project" or choose from the list below.